Bolivian President Evo Morales has said that US anti-drug agents are not welcome back in his country, despite an agreement to restore diplomatic ties. Mr Morales said that he himself had been a "victim" of the US Drug Enforcement Administration (DEA) as a coca growers' union leader. The DEA's exclusion from Bolivia was a question of "dignity and sovereignty". 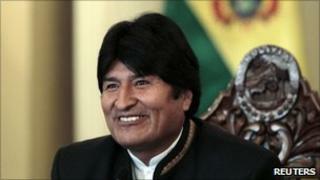 Bolivia and the US agreed to restore relations on Monday, three years after Mr Morales expelled the US ambassador. Although details of the deal signed in Washington have not been made public, sources on both sides have said there was an agreement to exchange ambassadors as soon as possible and to work together to combat drug trafficking. But Mr Morales stressed that the improvement in relations would not mean the return of the DEA. He expelled DEA agents in 2008 along with US Ambassador Philip Goldberg, accusing them of conspiring against his government - charges the US has always rejected. "For the first time since the foundation of Bolivia, the US will respect Bolivian laws and constitution," Mr Morales said on a visit to Colombia. "The subordination and subjection is over." The message was repeated by Vice-President Alvaro Garcia Linera, who called the DEA a "mechanism of political blackmail". "The DEA is not coming back to Bolivia. We don't need it. With difficulty but with growing strength our police, our intelligence services and our armed forces are fighting against drug trafficking," said Mr Garcia. Bolivia is the main cocaine producer after Colombia and Peru. Mr Morales used to grow coca leaves - the main raw material for the drug but also a key part of indigenous traditions in Bolivia. The US has welcomed Monday's agreement as the first step towards the restoration of full diplomatic relations and close co-operation against drugs.